First of all, let me just say this – I wanted to do it. Sure, it’s not like it was on my bucket list, but I made no effort to get out of it when I received the notice in the mail. So no comments about me not being intelligent enough to get out of jury duty, okay? Forget scaring kids straight by showing them a jail, show them a room of potential jurors. Once they see how their fate could be placed in the hands of a group of these people, they’ll be helping elderly women across the street and attending church on a regular basis, just to cover their tookis. Camoflauge shorts and flip flops, a ‘Slayer’ t-shirt, skin-tight shorts, an NRA t-shirt, more flip flops, beer logo baseball caps, jeans with more holes than material, pajama bottoms, leopard print everything… I could go on, but I’m sure you get the idea. It looked like a Wal-Mart in there. Yeah, I didn’t exactly wear a suit myself, but I think I came across a bit less scary to the defendants there behind the tables. 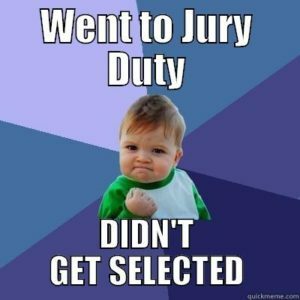 Throughout the next two days, I was called into a few of the other courtrooms, given information on cases, “introduced” to the attorneys and defendants, asked incredibly simple questions, and forced to wait as the attorneys scratched their way through the list of prospective juror names. And…each time, my name was one of the ones crossed off the list. I won’t tell you my secret, but let’s just say that I wasn’t surprised at all each time I was dismissed with a “thank you for your service, you’re free to go”. The only drawback to escaping from service was that there wasn’t a juror room in that entire building. And, because every courtroom was active through both days (is that bad? Too much crime in the area?) there was no place for us to sit and wait for the day’s next opportunity. So, those of us who weren’t selected simply sat in the hallways watching officers walk orange-suited prisoners from room to room, listening to attorneys on break complain about their days together, and playing on our cell phones. It was the justice system hard at work. After running my phone’s battery down for two straight days searching the Internet, emailing everyone I knew and playing solitaire, I was finally, officially dismissed. And I thought back through my days of service and realized that I hadn’t done or learned a thing. But I know that if one of the characters in my novels misbehaves and isn’t working well with me, I just may send him or her off to jury duty. Let them be warned. But it wasn’t all bad. Eventually, arriving in the mail was a check from the county to reimburse me for all of my time and service. And, when I stopped to figure it out, I realized that I’d made a whopping $1.29/hour for my time. Wow. If I’m called for jury duty again, everyone’s guilty! This entry was posted in Fayette County on July 6, 2017 by Drew. I’ve done it twice, once I was drawn first out of the lottery and told I would be foreman (I respectfully declined the honor, which l was told was “never done!” but they let me do it anyway) second time I could have claimed hardship due to distance from the courtroom, but they had to put me up and pay for all my meals for five days. I happily did my duty ’cause it was like a paid vacation on the resort side of our island. It’s all good! That sounds pretty good. I was kind of hoping I’d get sent to be on the Cosby trial and get a mini-vacation that way. But is going to Philadelphia really a vacation?